Even though both Renata and I are off on Saturdays, that day tends to be a bit hectic in our household – after all, we both have a bit of a tight schedule that includes going to the gym and food shopping, writing assignments I was unable to wrap during the week and of course there is always some kind of outing – something increasingly true when warmer climates set in and the number of concerts we are interested in going to become more plentiful. Long ago we reserved Sundays for more elaborate dishes – the other evening I spent hours laboring over the pots to make Polish golapki (stuffed cabbage), a process that includes boiling and peeling leaves from cabbage, preparing the stuffing and finally steaming the stuff in broth for over an hour – something I am completely unable to do unless I have tons of time on my hands. For reasons I cannot recall Saturday lunch became “sandwich day” for us. It wasn’t something we actually planned out from the start, but it became something we began doing simply because it was convenient, fast and not really messy. But just because we are putting something between two slices of bread (or in some cases, a large flour tortilla) does it mean we are getting lazy. There are many ways to create varieties of tasteful and often healthy options. When I make simple hot dogs, I take a page from Brazilian culture and add homemade vinaigrette that includes chopped onions, bell peppers and tomatoes instead of just using ketchup and mustard. When it’s not too hot, I will make a zapiekanka – a meat-free option that includes mushrooms, cheese and a copious amount of ketchup. And of course I do a lot of research for new recipes and ideas to make lazy “Sandwich Saturday” a special day every time. 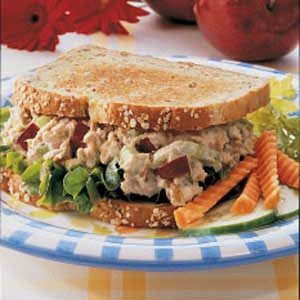 A recent discovery was a twist on the classic tuna salad sandwich that I found on Sheryl Crow’s “If It Makes You Healthy” cookbook – an easy and nutritious option that had us licking our fingers at the end of the meal. 1.In a glass or plastic bowl, mix with a fork the tuna, apple, celery, mayo, parsley and lemon juice. Avoid over stirring, you don’t want it mushy. Season to taste with salt and pepper. 2.Serve right away – with salad greens and other veggies, if desired-or cover and refrigerate for up to 48 hours.